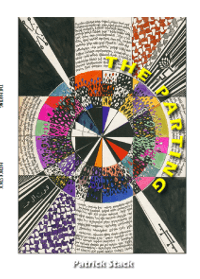 The Parting is Patrick Stack’s debut poetry collection. 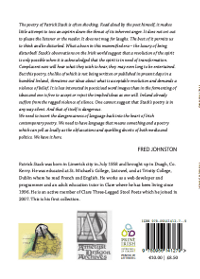 It was published and launched in April 2013 in glór, Ennis, Co. Clare. 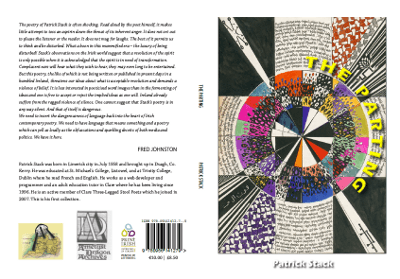 The collection consists of 65 poems with the earliest dating to 1977 and is illustrated with pencil drawings by Órla Walsh. The poetic forms featured include free verse, sonnet, haiku, chained haiku, senryu, a pantoum and an epithalamium to the poet’s younger sister on the occasion of her marriage. Another feature of the collection is its linguistic range, with poems in Irish, Spanish and West African Krio, though the majority are in English. 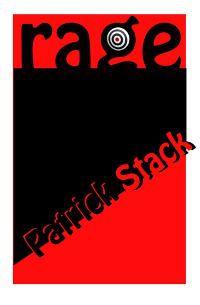 “The poetry of Patrick Stack is often shocking. Read aloud by the poet himself, it makes little attempt to toss an aspirin down the throat of its inherent anger. It does not set out to please the listener or the reader. It does not mug for laughs. The best of it permits us to think and be disturbed. What a boon in this mummified era – the luxury of being disturbed! Stack’s observations on the Irish world suggest that a revolution of the spirit is only possible when it is acknowledged that the spirit is in need of transformation. Complacent ears will hear what they wish to hear, they may even long to be entertained. But this poetry, the like of which is not being written or published in present days in a humbled Ireland, threatens our ideas about what is acceptable revolution and demands a violence of belief. It is less interested in poeticised word images than in the fermenting of ideas and one is free to accept or reject the implied ideas as one will. Ireland already suffers from the ragged violence of silence. One cannot suggest that Stack’s poetry is in any way silent. And that of itself is dangerous.